A while ago (back in October) I ordered a few kits from QRPGuys: a dummy load, mini-paddle, mini keyer and two digital frequency counters (PTH and SMD versions). I finally got around to assembling the dummy load, paddle and keyer over the past week. The dummy load was the easiest to assemble, and parts placement was pretty obvious (I’m only a little bit bothered because the resistors don’t line up…). 5 minutes of soldering and you’ve got yourself a nice compact little 12 watt dummy load that also lets you measure power output via a voltage measurement. The mini-paddle was only a little more difficult because of the size and length of the screws being used to attach the paddles. Still a relatively easy build, although you have to be careful with the alignment of the little PCB pieces that are soldered onto the base. The hardest part was getting the little nuts that hold the paddles secured. There’s not a whole lot of space to work in, you have to hold the screw, spacers, washers and metal paddle part while trying to get the nut on, and there’s not a whole lot of screw remaining to get the nut started on. Moderately difficult to assemble. In terms of parts count, the single lever keyer/paddle was the largest kit, but easier to assemble than the iambic mini-paddle. On the electronics side, the only thing I had to consult the assembly manual for was to find out the correct orientation for the 1N4148 diodes. Placement of all the other parts is pretty obvious from the silkscreen outlines. On the keyer side, assembly was similar to the mini-paddle, but with only one lever to worry about, getting it put together was significantly easier. I did end up leaving off two nuts for the two screws that serve as contacts for the paddle. With the nuts, the screws were just too far away from the paddle. I don’t know if the screws I got were just too short to begin with, or if the kitting changed but the instructions didn’t get updated. True to their mission, these are fun, inexpensive little kits to put together. Looking forward to working on the frequency counters next. I camee across N5ESE‘s site and started browsing around some of his projects. He’s got quite the list of them. In his Gizmos section is an RF probe which looked pretty easy to build. I had a set of those springyy hook-y grab-y DMM leads that were broken, so I cut off the spring-y hook-y grab-y part to use for the DMM side. On the work bench was a perfectly sized piece of PCB from when I was experimenting with cutting and scoring PCB. From the RXTX build, I just happened to have some extra 0.01 μF SMD capacitors which were perfect for the job. A 1N34A diode and 4.7MΩ resistor finished off the parts. I used a small hacksaw to score the PCB and divide it into three sections, cut out a notch for the diode and cut the head off a brass nail to serve as the probe. Soldering everything in place was pretty easy. 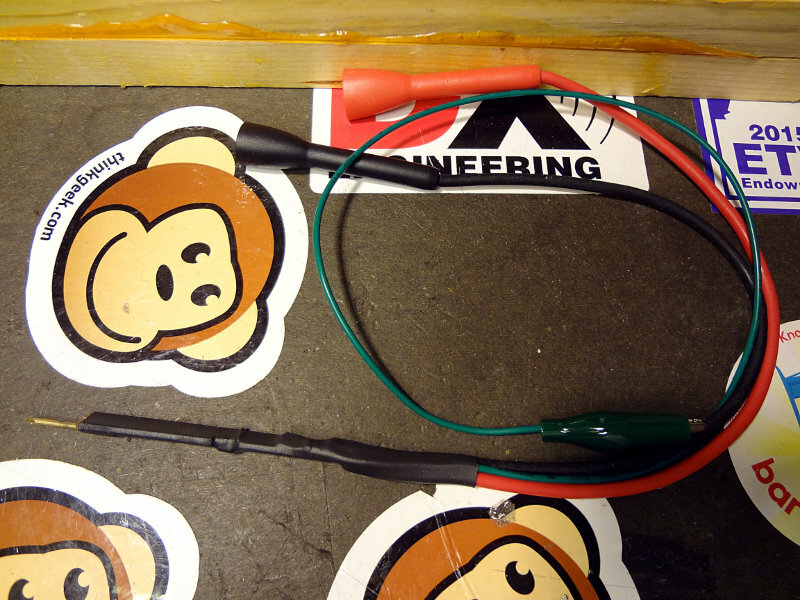 Soldered on the leads and a ground wire with alligator clip and put everything into a shrink wrap tube. The full probe, with all the leads ready for some RF to measure. I still need to find a decent enclosure to shield the probe with.